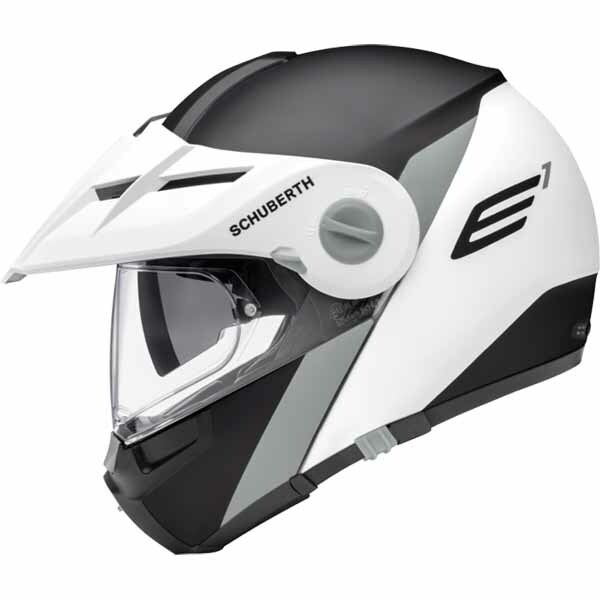 The Schuberth E1 helmet has the characteristics and functionality of a flip-up helmet combined with the looks and the feel of an adventure helmet. THE ADVENTURE BEGINS WHEN THE ROAD ENDS: On the way to work or to the seaside - whichever way you take, the new E1 by SCHUBERTH lets you concentrate entirely on what’s in front of you. Let the others use the trodden paths. The innovative dual sports helmet for enduro touring and adventure bike riders offers the highest comfort, flexibility and safety for on- and offroading. FITS PERFECTLY. FITS SAFELY: The motor cycle helmet is in accordance with the testing standard ECE R 22.05 and can therefore be used throughout Europe. The E1 is available in sizes from XS to 3XL. This conforms to head circumferences from 52 to 65 centimetres. THE AERATION PROVIDES EVEN MORE AIR TO BREATHE: A complex air channel system on the inside of the helmet shell provides a comfortable air flow. The head aeration leads the air into the helmet for circulation. The visor aeration prevents the visor screen misting-up. The large regulatable auxiliary aeration on the chin piece gives you space to breathe on demanding tours. It adds fresh air by the litre when it really counts. FOR DRIVERS WITH A CLEAR VIEW: THE VISOR: All SCHUBERTH visors are visors of the optical class 1. They warrant an undistorted view and are anti-scratch treated. Turbulators for noise reduction on the visor edge. The visor mechanics allow a quick exchange completely without tools. Of course the E1 features an anti-mist screen. AND OUT INTO THE LIGHT: SUN VISOR: A sun visor is built into the E1 straight away. The sun visor can be extended or retracted with one move of the hand using a slider on the helmet edge. Now you can react lightning fast to sudden sun glare. OPEN AND CLOSED - WELL COVERED INTO THE ADVENTURE: The chin piece of the E1 can be swivelled up as a single piece together with the visor and shield. The shield can be fixed in three different positions. The visor can be used independently from the shield. THAT FITS: SAFELY AND COMFORTABLE: COOLMAX® textiles provide a good climate on the inside of the helmet and transport moisture effectively away. This creates constantly a good climate and permanent cooling for the driver. Of course the inner lining is Öko-Tex 100. It can be removed easily and can be washed. QUIET FOR THE EAR - STABLE IN THE WIND: THE AERODYNAMICS AND ACOUSTICS PACKET: The E1 is stable in the wind, without pendulum effect, lift, or buffeting and on top of it is extremely quiet. Apart from the adapted helmet shape, a spoiler is responsible for this streamlining. It has been tested many times in the wind channel, has been improved and designed for maximum wear comfort.